Fox News published a story today (12/3/12), describing one patient's runny nose that was not due to allergies, but in fact due to brain fluid leaking through a crack in the roof of her nose. Also known as CSF leak (cerebrospinal fluid leakage), correction of this problem can be performed endoscopically through the nose without any incisions on the face. An interesting trivia related to CSF leaks is that actor George Clooney suffered one after a blow to the head while filming a torture scene in the 2005 movie "Syriana". 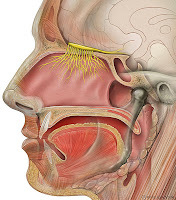 Diagnosis can be obtained simply by taking some of this nasal drainage into a red-top tube and getting it tested for beta2-transferrin which is a protein found in brain fluid, but not in normal nasal secretions. The take-home message is that not all runny noses are due to allergies, especially if it is continuous and only occurs on one side. Of note, the Washington Post also published a similar story of a different patient with the same problem in 2010. Woman's running nose revealed to be leaking brain fluid. Fox News 12/3/12.